Recently I’ve been fascinated with knitting doubles. I’m enjoying how the same pattern works up in different colorways or in different yarns. You’re looking at Alex Tinsley’s Fructose. 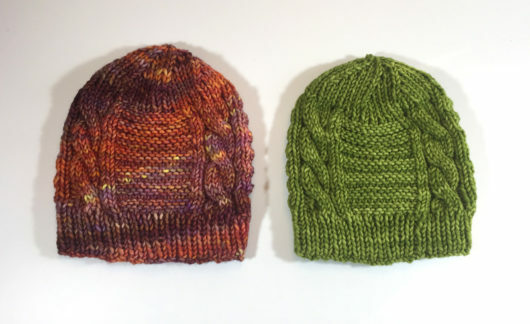 I’ve knit both my Fructoses in Malabrigo Rios. These two colorways are big favorites of mine. The green one is lettuce. OK, you’d have figured out that’s the green one. And the purple/orange/red is Archangel. Beats me why. But it’s a wonderful colorway, especially for one-skein projects. That’s because there seem to be very big differences between skeins. But every skein I’ve seen is wonderful. 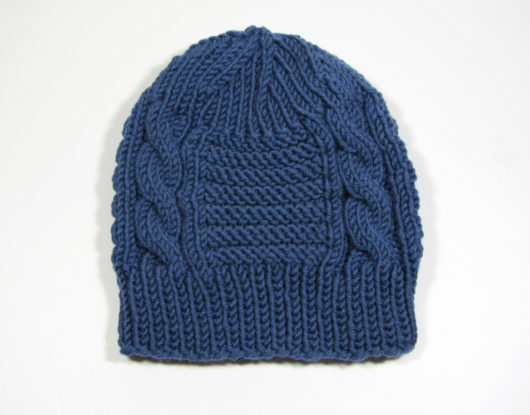 The strong vertical lines combine with strong horizontal ones to give the hat wonderful structure. And the sweet bonnet-like slit in the back leaves room for a pony tail or allows the hat to be worn low on the back of the neck to keep out winter’s chill. Each Fructose took 52 grams. I should have had 48 grams left. But both my skeins were “light.” I’ve read that a skein with 10% more or 10% less is considered acceptable. I suppose I should be magnanimous and accept that if sometimes I get more I shouldn’t grouse about getting less. 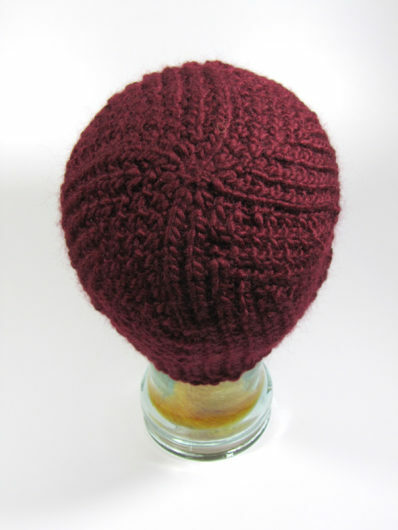 Maybe I would if I ever got more than a dollop of yarn beyond the ballband amount. Both these skeins were shy about 8 grams. 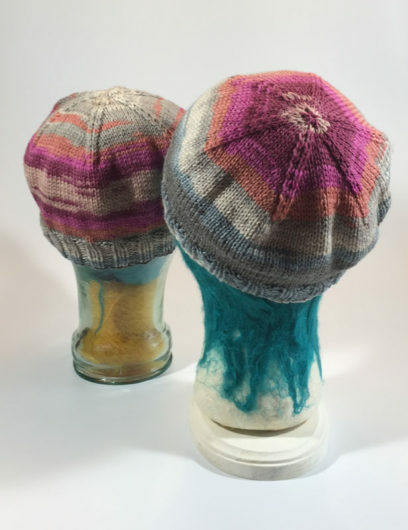 With my mission of not wasting yarn or leaving it to languish in my oddments bags, I decided to knit up a pair of toddler-sized The Thinker hats. Susan Villas Lewis has come up with such an excellent all-sized pattern. These are the 8th and 9th Thinkers I’ve knitted. 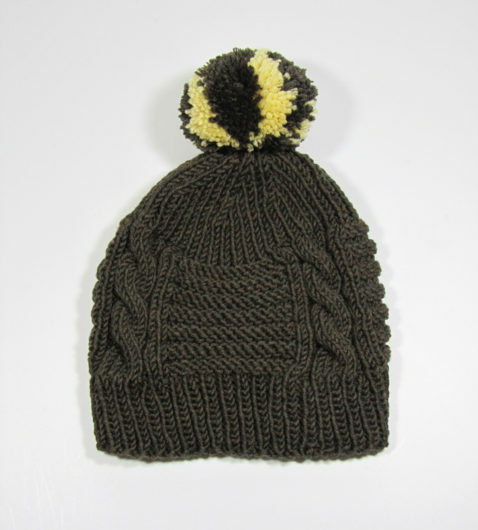 In the toddler size, there are three lines of easy cable that ring this hat. 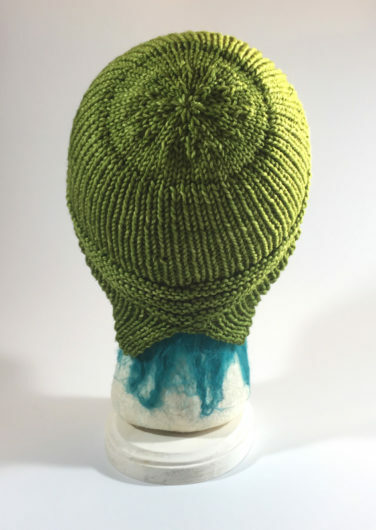 It’s a seriously excellent use of yarn. That’s also true of Clara Parkes Hill Country Hat. Hill Country is a bulky-weight freebie available on Ravelry. It’s also included in Parkes’ excellent book The Knitter’s Book of Wool. Hill Country is another pattern I return to whenever I have about 110 yards of bulky asking to be knit up. This brown one is knit of Brown Sheep’s Lamb’s Pride Bulky. 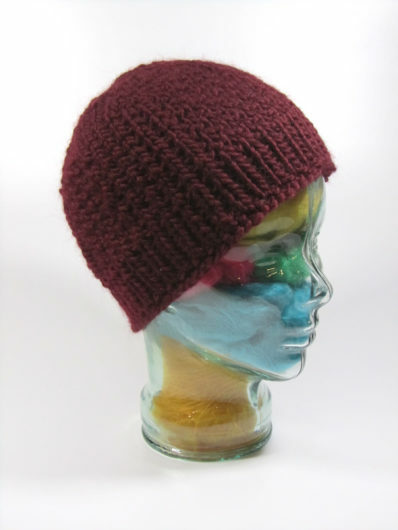 One of the strengths of the hat is that, depending on the yarn and sometimes the colorway, it’s a definite unisex design. 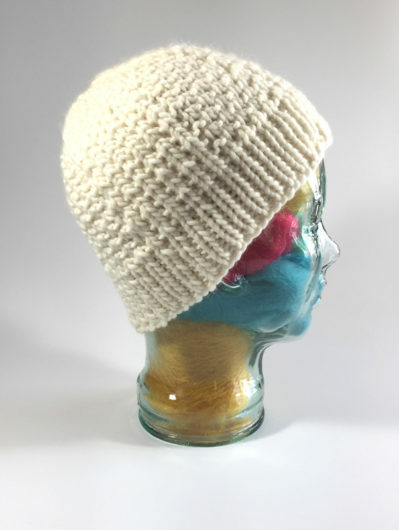 This white one is knit in Valley Yarn’s Berkshire Bulky. As ever, hats don’t get beyond first base with me if they don’t have well-behaved crowns. Plus they get extra points if, like Hill Country, they have something interesting going on in the crown section. I think this swirl works well. I knit this next pair quite awhile ago and didn’t get around to showing them off. This is Elena Nodel’s bulky-weight freebie, Tega. An excellent pattern. 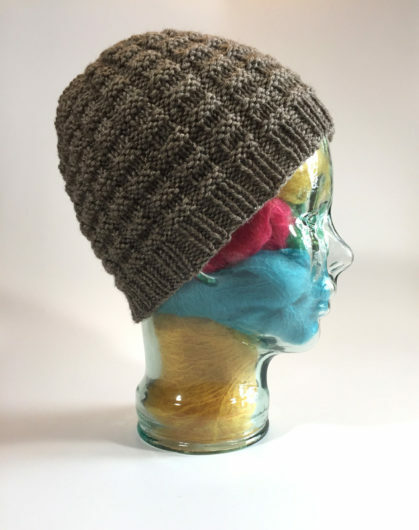 It’s only available in one size, adult, but that’s easily adjustable by using a less beefy yarn weight and smaller needles. My first Tega is knit in Reynold’s Lopi Bulky. 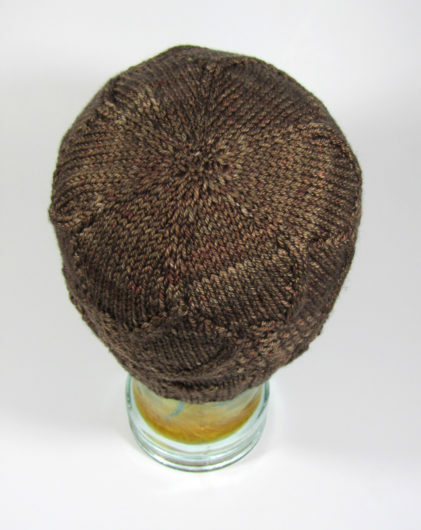 I used size 6 for the ribbing (that was pushing it) and size 9 for the body of the hat. Those extravagant cables are wonderful. And the thoughtfully planned crown is a winner for sure. 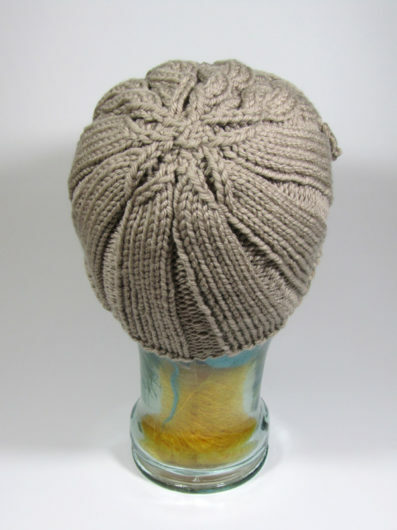 As for what head will wear a bulky-weight Lopi hat, it needs to be a very cold one. And a head with a very high “but it’s scratchy” threshold. I washed it in Eucalan to try to tame the itch factor, but not with much success. It’s much softer but still scratchy as heck. And I actually have a high tolerance for such rustic yarn. If you decide to knit Tega in a good superwash bulky, like this Valley Yarns Superwash, there won’t be any complaints about itchy heads. The yarn also has great stitch definition for a bulky, which is a big plus for this pattern. At some point, I promise, I’ll stop concentrating so much on heads and will let your eyeballs feast on something else. Not today though. 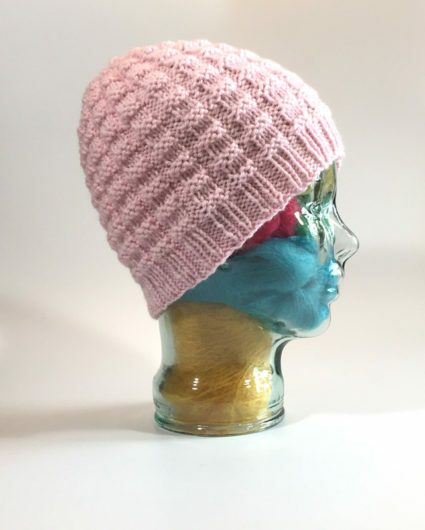 I recently hatched plans for how my knit hats can tempt teens to put something on their heads and, with that, my hat knitting went into high gear. Even Glasshead is beginning to voice boredom with all these hats. This one is Agnes Kutas-Keresztes’s freebie, Christian. My gray Christian is knit in about 130 yards of Berroco UltraWool. And this pink one is knit in Plymouth Encore. Crowns can make or break a hat. Check out this wonderfully organic one. 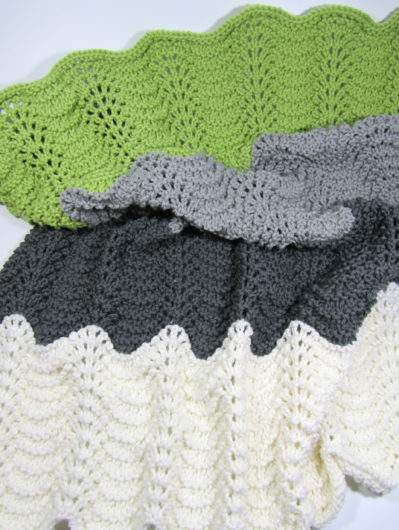 If you’re up for an easy, rewarding (and free) pattern, definitely consider Christian. Just when you think I can’t possibly be assaulting you with any more hat twins, I’ve still got more. This set is Susan Mills Harriet. Quite uncharacteristically, I knit my Harriets in exactly the yarn the pattern calls for: Classic Elite’s Liberty Wool. The multi-color Liberty Wool means that every Harriet will be unique. My 50 gram balls weighed closer to 40 grams, which was a disappointment. But two balls still ended up with two Harriets, just one large and one medium. The hat is meant to be a beret. But I think most heads would want to wear it as a beanie. 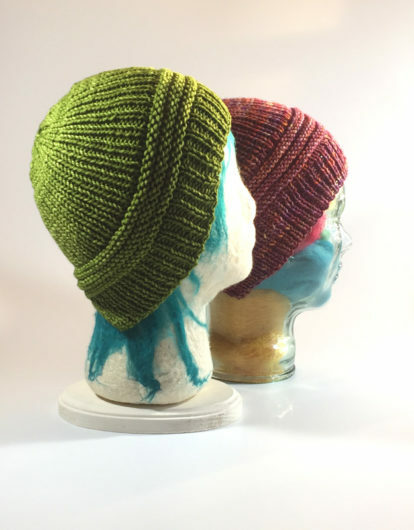 I made some sizing modifications on this next pair of hats, but I am totally liking the look. It’s Benjamin Matthew’s On the Grid Beanie. I was lucky enough to secure a copy of the pattern during its few days when Matthew released it free. 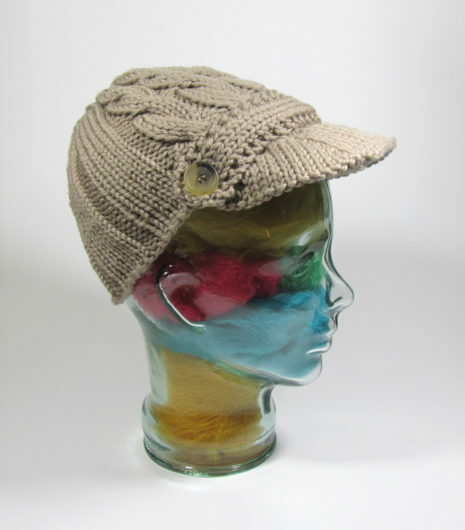 But this hat pattern is totally worth the 6 dollars he’s charging for it now. 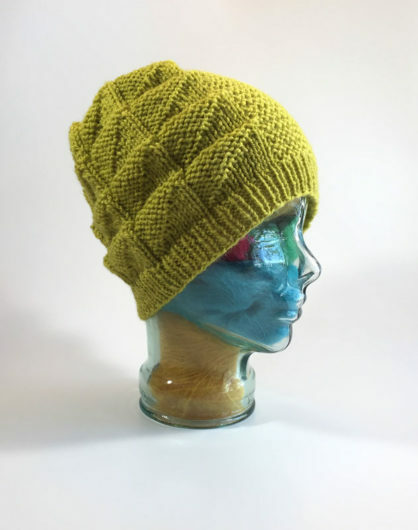 By the way, to keep an eye on designer short-term freebies, join the Free Stuff Rocks (f/k/a Lovin’ the Freebies) group on Ravelry. The group forum will also alert you to new forever free patterns and to discounts that are available from designers. Back to On the Grid. Both mine are knit in Plymouth Encore. 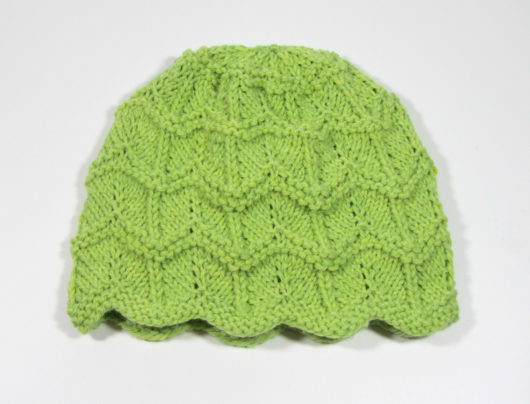 The pattern calls for a more lightweight worsted and 19 stitches to 4 inches using garter stitch as the gauge. Encore required some sizing mods. I knit 10 rows of ribbing. In Encore, needle size 6, that was about 1.5 inches. I knit 4 repeats of the triangle pattern instead of 5, which gave me a bit over 6 inches of triangles. From the start of the decreases to the top added about 2.75 inches. 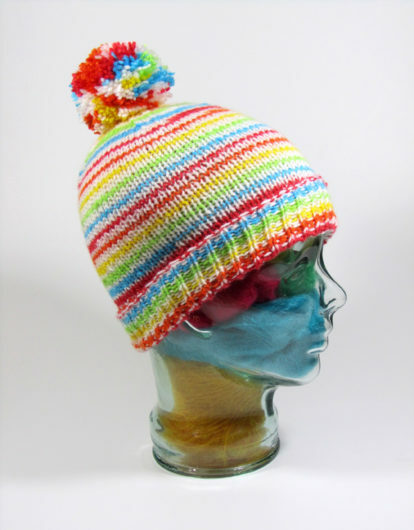 So, even modified, this is quite a long beanie–9.25 inches. But I can already tell that this quick knit is a pattern I’ll return to regularly. You know that means it’s got an interesting crown. GlassHead is weeping. Maybe you can hear her? Both Fructose have already been given away and she wanted to hang on to the Lettuce one and keep wearing it for awhile. I’m consoling her at present with the Encore Sour Apple On the Grid, a similar colored hat. 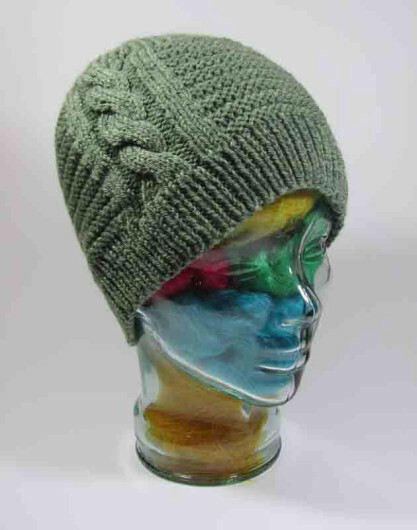 This is Leslie Taylor’s Mayfly Hat, knit in Mountain Colors Perspectives RiverWash Sport. This was a Mountain Colors’ kit, purchased at a local yarn shop closing at a ridiculously wonderful discount. 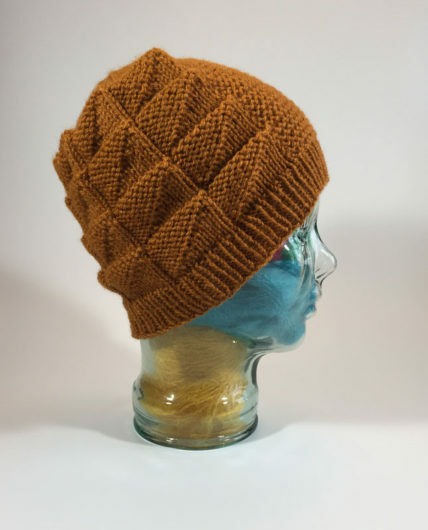 The pattern is also available for purchase on Ravelry. With the gradient reds doing their thing, it’s a bit hard to see in my photo, but that’s three Estonian braids just above the ribbing. Honestly, I don’t much care for the effect of the braids in this yarn. But it does dress the hat up a bit. I made a few modifications. I didn’t do a provisional cast-on–not with the first row planned as a 1 by 1 rib. A provisional cast-on might have worked well if the next row was knit plain. Otherwise my sense is it would have been difficult to pick up and knit that mix of knits and purls in sportweight yarn on size 3 US needles. 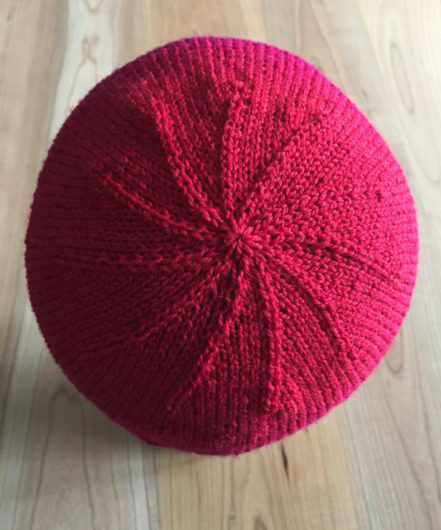 Instead, I did my folded brim by knitting a turning round of purl. Then I knit ribbing for a few more inches. Next I knit the cast-on stitches together with the live stitches and I was off to the races to tackle the body of the hat. My only other modification was to move up one needle size for the body of the hat. I think that’s a common convention that works well. 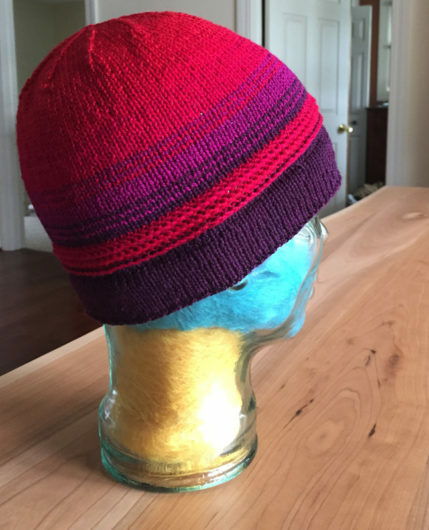 The colors are what make this hat shine. And, as always, well-behaved crown decreases (no pointy problem) are much appreciated. 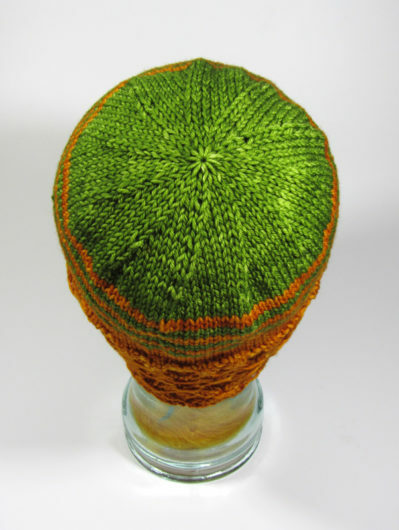 This next hat is Herriot, a free pattern, by Nicole Montgomery. Let’s do this in reverse. 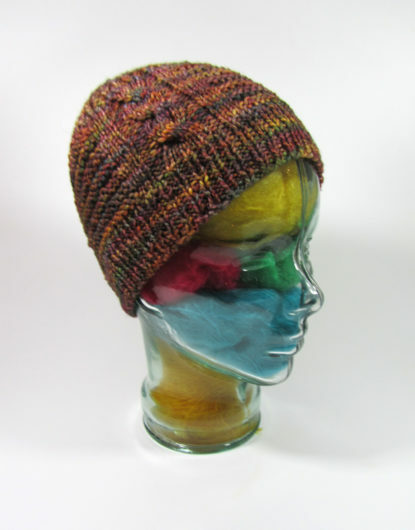 Here’s the crown, knit in Malabrigo Rios. 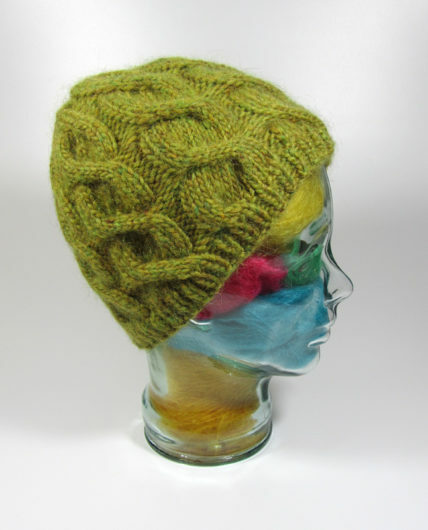 The pattern calls for a bulky weight, and Rios is only a worsted. But I couldn’t get gauge (18 stitches and 25 rows to each 4 inches) in any bulky weight in my stash. Again, a totally not pointy crown. Perfect. What makes Herriot special is the use of a stitch that I don’t think we see enough of anymore: smocking stitch. 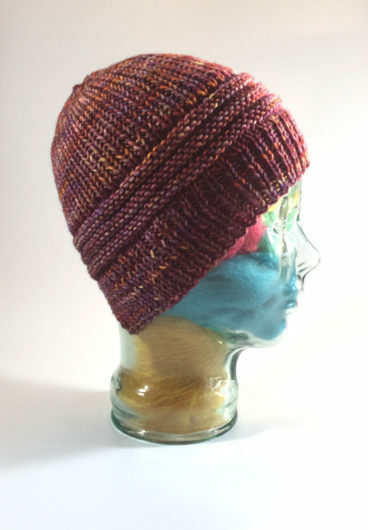 I decided to use up some precious Rios leftovers for this hat, in two favorite colorways (Sunset and Lettuce). I also worked a bit of a fade between the two colors. This is a cool hat worked in a solid color as the designer intended. But I rather like my quirky stashbuster version. 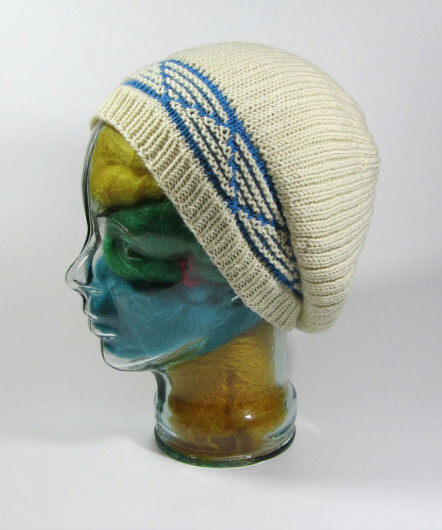 This next hat is Windshield by Niina Talikka. The pattern calls for a DK weight and I knit mine in Anzula Cricket. I’m unsure how the diamond motif of this hat became so indistinct on one side. Cricket has good stitch definition, so I didn’t expect the hat would have that problem. 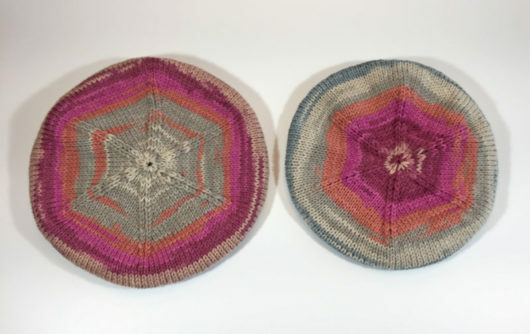 The designer says that “blocking is highly recommended to make the motif visible and for the hat to form its gentle slouch.” So, as directed I blocked. It helped make the motif come to life, but not as much as I hoped. Still, I like this hat quite a bit. Cricket is 80% merino, 10% nylon, and 10% cashmere goat. It feels wonderfully soft. No one will complain “…but it’s so itchy.” And I also don’t see anyone complaining “where’s the second side of my diamond motif.” If you decide to knit Windshield, take a look at the project pages for this hat on Ravelry. The patterning definitely pops better in a solid color. Windshield is a top-down hat. That can be a bit of a bear to pull off. But the bear only roars for a few rounds and then it’s tamed. I’ve posted about it many times, here‘s two, and here’s another and here’s two more. My newest version is knit in Malabrigo Rios. It used to be something else, part of a (sort of) poncho. 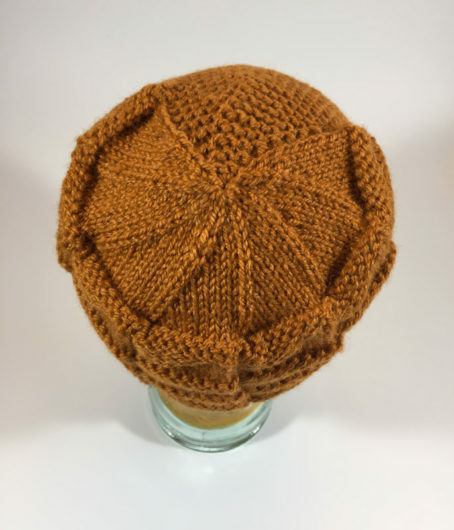 When a knitting buddy’s husband saw her working on hers he asked if she was knitting a lampshade. Every time I was tempted to wear it all I could think of was how nice a lampshade it might have made. Anyway, I frogged the thing and now I have a lot of extra Rios. Knitting The Thinker was a good save, I think. And now there’s much more Rios for me to knit with. So, there’s a little guy I’ve not met named Cooper. But I know his uncle. He’s six years old. Cooper, that is. Not his uncle. Cooper needed some hats pretty quick. Fun ones. Sporty ones. Ones to cover up some bad hair days his doctors have decided he needs. Cooper’s not an “off-the-rack” kid, so finding some not-off-the-rack hats seemed like a good idea. 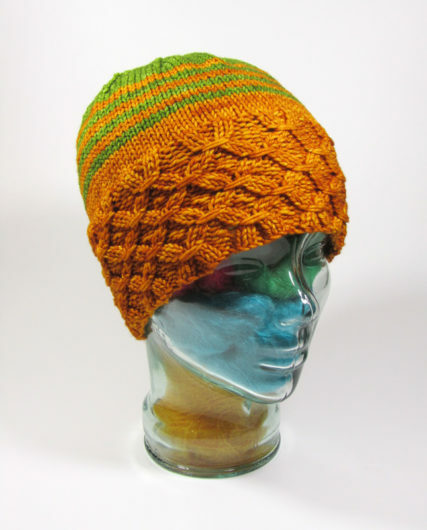 This is Capitan Hat, a free pattern by Rosie Garmendia. Cooper’s is knit in Valley Yarns Superwash Bulky, the Webs house brand. It comes in 26 colorways and, unfortunately, what I had in my stash was not the most exciting of them. But I pressed “tan” into service anyway and I’m quite pleased with the results. 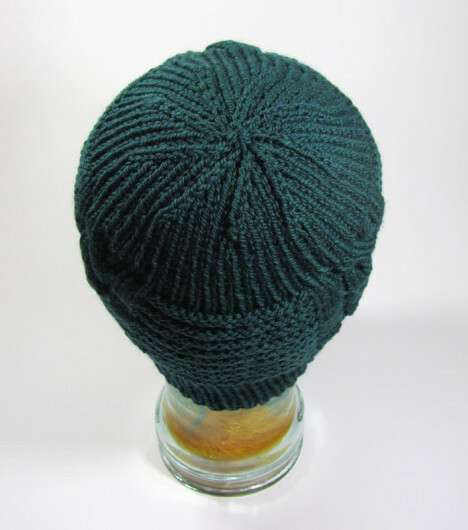 I was concerned if the two-surface brim would hold up without stiffener inside. It does. Just the thing for a baseball fan, I’d say. This next one is an old stand-by. Cooper has a connection to Michigan State University so the Sparties were the inspiration. 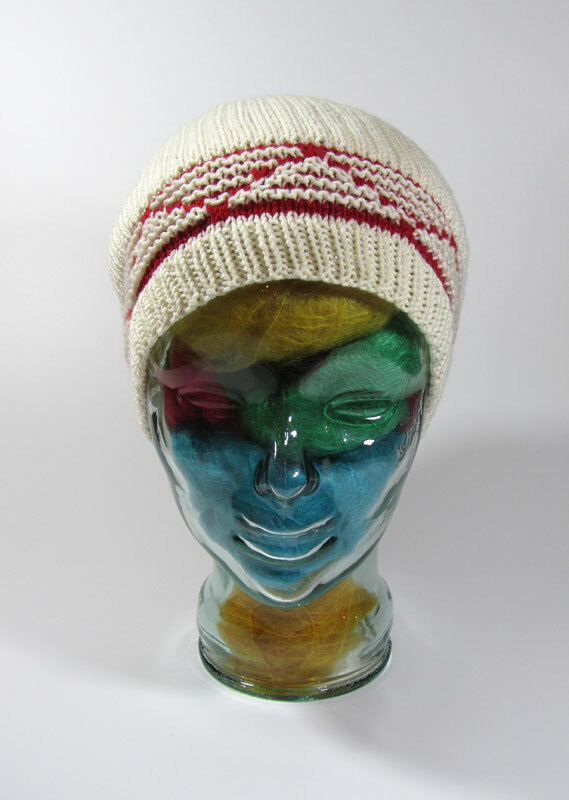 This is a vintage (but still available) Fiber Trends pattern: “School Colors Hat, AC-53,” by Betsy Lee McCarthy. That’s a double roll brim. 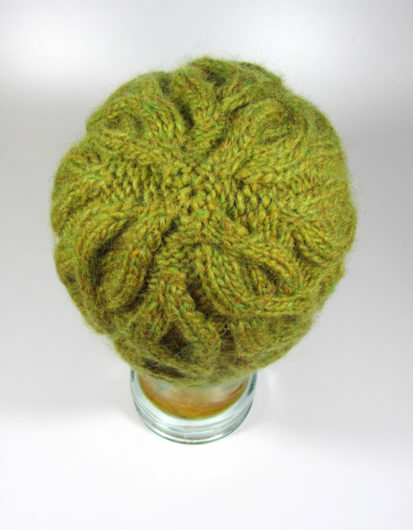 You start out with the green and do reverse stockinette. 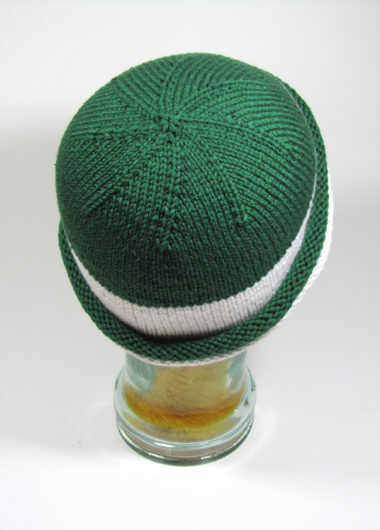 Then you do the white, in stockinette, then the green at the top. You sort of pull the white down and roll it back on itself, so the reverse side shows, and then the green from the first band of knitting falls in place. Bottom line: follow this pattern exactly as it’s written and it will all work out. There are no errors. 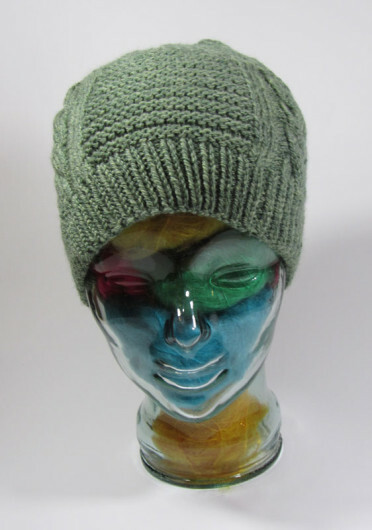 I wanted something very comfy so I used Berrocco Comfort, worsted weight. No scratchiness. Bet you can’t make just one! 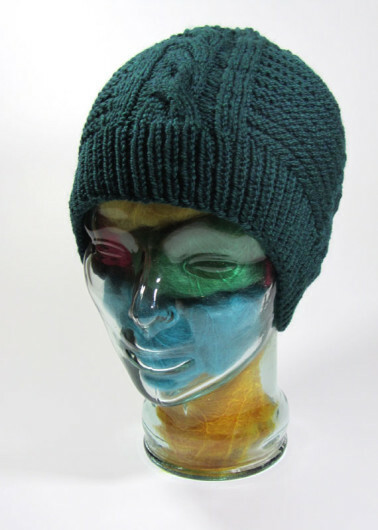 This next hat is another Susan Villas Lewis’s “The Thinker.” I have knit so many Thinkers it’s getting kind of embarrassing to keep linking to them all. But search for Thinker here on my blog and up they’ll pop. Cooper’s is knit in Plymouth Yarn Worsted Merino Superwash Solid. Soft. Easy care. Great stitch definition. My trusty Clover pompom maker worked overtime on this batch of hats. I know, The Thinker in this size doesn’t fit Glass Head really well. But Cooper’s a little guy. Cooper like clowns. So I bought a skein of clownish-looking Plymouth Yarn Toybox Candy. It’s an acrylic that can’t help but put a smile on someone’s face. 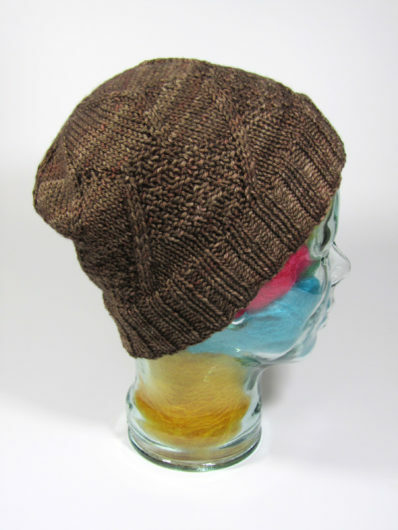 This is Purl Soho’s “Classic Cuffed Hat,” another freebie available on Ravelry and on the Purl Soho website. Everything this designer produces is classic. Sophisticated. So I gave in to the temptation to knit her design in a gaudy colorway. That’s because Purl Soho patterns go to art galleries. In New York City. They practice yoga. But Cooper’s Classic Cuffed Hat shouts. And this last hat is Clayoquot Toque, a modern fair isle freebie from tincanknits that tincan says is a great blank canvas for testing yarns and color combinations. It really is. I wasn’t sure about whether these three colorways of Shalimar Yarns Breathless DK would play nice together. But I think they did. 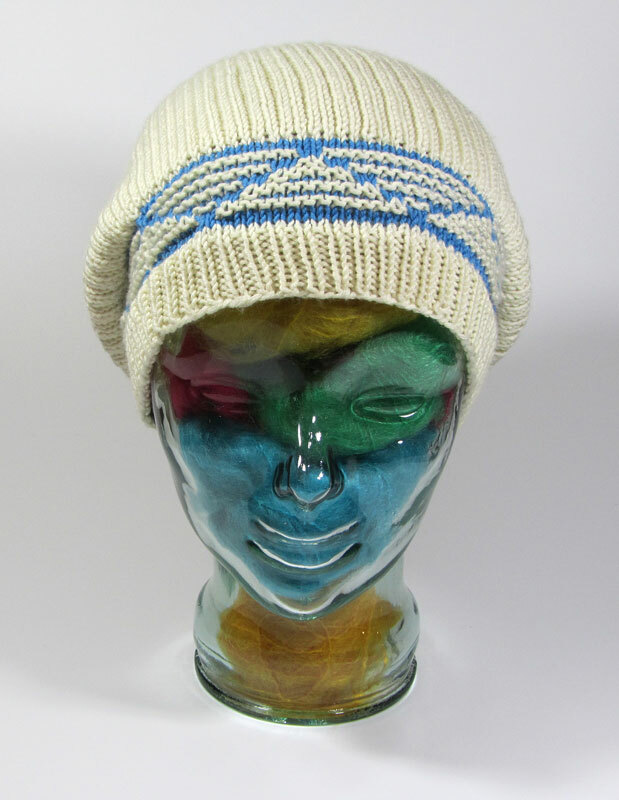 And this 75% merino, 15% cashmere goat, 10% silk concoction is so soft it should keep a little guy’s head brightly covered but not overheated. Let me try that again. Stuff for small ones. 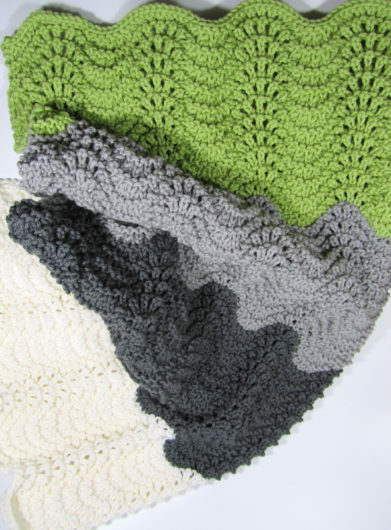 This is another Welcome Home Blanket by Kirsten Hipsky. It’s such a simple classic design. A very easily memorized feather and fan motif. The first time I made it, I basically used the color scheme the designer intended. Actually I did it in 5 of the 7 recommended colors. This time I worked for a match to the baby’s bedroom, done mostly in spring green and gray. I really like the way it came out. More importantly, so did Cecelia’s mom and dad. They even honored the work by using the blanket to bring this late December baby home from the hospital. As before, I used the yarn called for in the pattern: the Webs “house” yarn, Valley Yarn Superwash Bulky. Toss in the wash and toss in the dryer. Easy care’s a must. This next one really is a small stuff. It’s Sleepy Sunday Hat, a pattern by Aimee Alexander. I knit it in Michigan’s own, Stonehedge Fiber’s Shepherd Wool DK. Such a nice weight for a little one. Warm enough without being weighty. Alexander’s pattern is very clear and easy to work up. 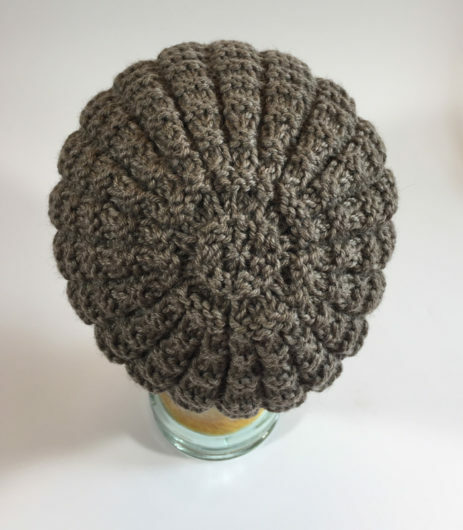 In case you’re liking this one and thinking it would be great for larger heads, the pattern includes 5 sizes: baby, toddler, child, adult small, and adult large. But it’s winter around here (even though it reached 58 degrees yesterday!) So little ones might need to be bundled a bit more. This next hat is the The Thinker, by Susan Villas Lewis. This version is knit in Plymouth Yarns Worsted Merino Superwash Solid. I made the toddler size, in terms of number of stitches. But I worked at a slightly smaller gauge. 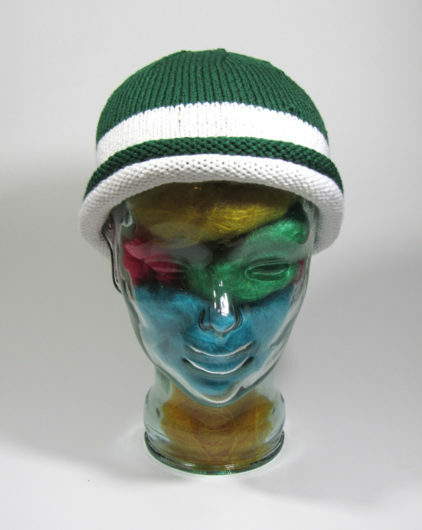 This isn’t the first time I’ve knit a Thinker. These two and these two (at the end of this post) also worked out really well. This is a Tony Tiger “GRRRRREAT!” pattern, for sure. This is Breck, by Susan Vilas Lewis of Stay Toasty. 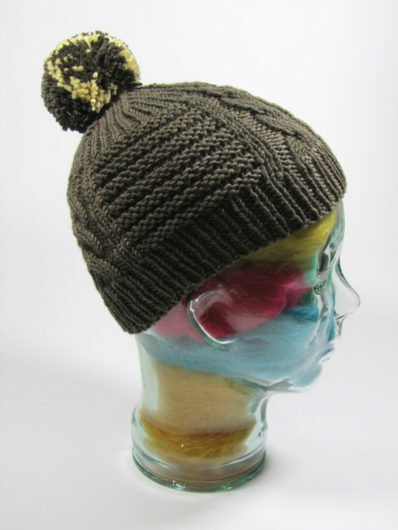 She’s Lewister on Ravelry, where you’ll find her designs. 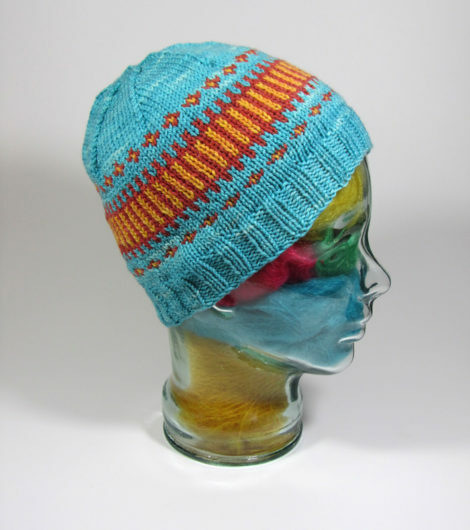 The slip-stitch colorwork is meant to evoke the mountains in Breckenridge, Colorado. 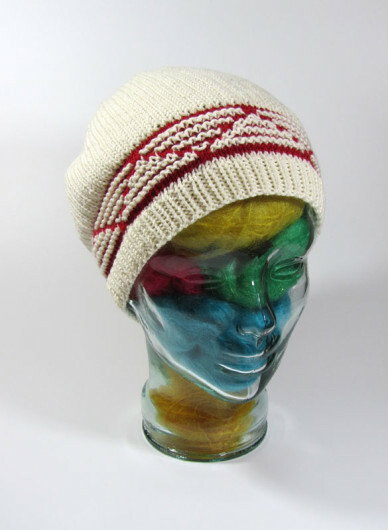 My red and off white version is knit in Debbie Bliss Cashmerino, a sport weight, which is what the pattern calls for. I was so pleased with the result that I decided to immediately cast on for a second version, this time knit in Plymouth Yarn DK Merino Superwash. In DK-weight, the hat ends up slightly slouchier, which is a nice effect. Here’s another look at both. Lately it’s been warm and a bit muggy. Typical August in Michigan. That’s when I often find that my knitting perversely turns to small, cold-weather accessories. 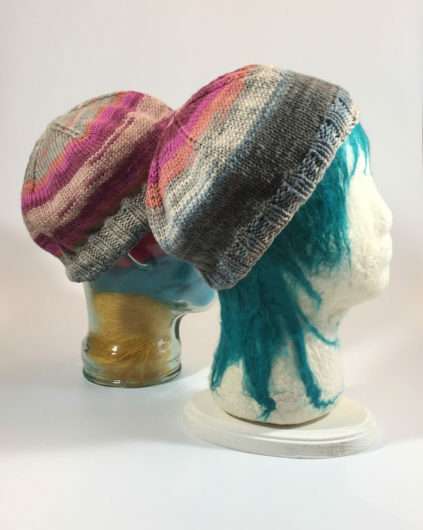 And hats are a major favorite because, well, maybe because… you only have to make one. 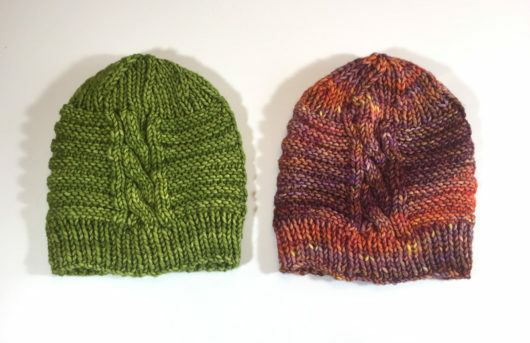 But then my recent knitting of hats has found me knitting two, so that theory doesn’t hold up. The Thinker is definitely a major favorite Stay Toasty design. Here it is knit in Stonehedge Fiber’s Shepherd’s Wool Worsted in the blue spruce colorway. The Thinker is a well-behaved hat even at its crown decreases. And here’s more Thinkering. Another version in the same Stonehedge Fiber Shepherd’s wool. The garter stitch horizontal bars and the two easy cables keep a knitter interested. But the pattern is totally easy. The pattern is sized from infant to large adult. This is one good hat! My trusty glass head is pleased to model these Stay Toasty creations. Check out a few more Thinkers here.